Sign up to receive Fluoride Free NZ Posts – see Subscribe via email on the right side of this page. See Auckland’s fluoride levels from November 2015 to May 2016.
d) request that staff, under delegation from the Chief Executive, write to the Minister of Health to request an update on their position in relation to the LGNZ remit that the Director General of Health be responsible for decisions on fluoridation. Chair of Auckland Council’s Policy and Strategy committee decided unilaterally yesterday (7 April 2016) that a petition from Fluoride Free New Zealand could be received but not debated on. This left councillors no option other than to vote to accept the petition or not. 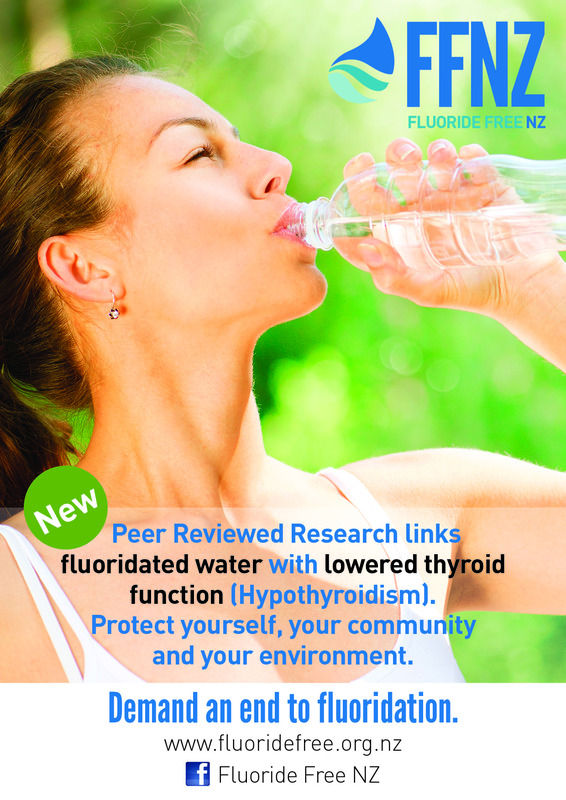 Read Fluoride Free NZ’s Press release. The residents of the Franklin Ward townships of Buckland, Patumahoe, Clarks Beach, Waiau Beach and Glenbrook Beach who receive reticulated water have been consuming fluoridated water since 2014 without their knowledge or the legally required consultation. The details emerged of the clandestine act when Fluoride Free NZ investigated the actual readings provided by Watercare’s own annual water quality reports. The analysis showed that these townships had never been fluoridated. The Watercare initiative to supposedly improve the water quality by connecting the townships to the Waikato Pipeline had the consequence of beginning fluoridation for the five Franklin Ward townships. The residents of the townships were not notified or consulted of this major change to their water supply. Not only are the townships being given fluoridated water without their knowledge, records show that sometimes fluoridation is being carried out at a higher rate than even the Ministry of Health recommends (1.1ppm). Watercare needs to take ownership of the incorrect implementation process but ultimately the Auckland Councillors are morally and legally responsible for Auckland’s fluoridation policy and must be held to account. Please sign the petition that will be presented to Auckland Council by Fluoride Free NZ on Thursday 7 April at 930am. 2. immediately cease adding fluorides to their water supply (this constituting medicating these residents without their consent) until such consultation has taken place. We reject the illegal medication of these residents by a private water company, accepted by the Auckland Council on 3 March 2016, in breach of the consultation requirements of the Local Government Act. Taken from the Watercare information report prepared for Auckland Council. or notification of fluoridation was made to the residents. Auckland Council accepts Watercare’s fluoridation report at the Regional Strategy and Policy Committee meeting on 3 March. Read Fluoride Free NZ’s press release. Read Watercare’s Fluoridation Information Report to Auckland Council. 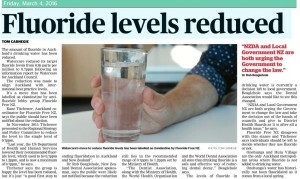 See a summary of Watercare’s fluoride levels from 2013/2014 showing an overdosing of fluoride to Auckland water users. See a summary of Watercare’s fluoride levels from November 2015 to May 2016. Watch the full Auckland Council Regional Strategy and Policy meeting from 5 November. Fluoride Free NZ start their presentation at 26 min. What was the outcome of the 2015 Long Term Plan on the fluoridation issue? Mayor Len Brown has the decision on reviewing fluoridation and FFNZ has been advised by the Auckland Council CEO that fluoridation will not be reviewed between 2014 – 2016. What parts of Auckland are fluoridated? All of Auckland except Onehunga and Huia Village. What fluoride chemicals are used to fluoridate Auckland’s water supply? IXOM (formerly Orica) supplies Hydrofluorosilicic Acid H2SiF6 to Council to fluoridate. What level is Auckland fluoridated at? Please advise if Auckland Council will be reducing the target of fluoridation from the current 0.7 – 1 ppm target range to the new single target of 0.7ppm as advised by the US HHS? Thank you for requesting ARPHS advice regarding the implications of the revised recommendations for Community Water Fluoridation (CWF) in the United States from a range of 0.7-1.2 ppm to a single level of 0.7ppm. It is pleasing to note that yet another thorough review of evidence relating to CWF finds it is effective, safe, and ethical. The rationale for reducing the maximum recommended concentration of fluoride in water relates to the access that Americans have to other sources of fluoride and the rise in the prevalence of dental fluorosis between oral health surveys. In New Zealand the Ministry of Health recommends the adjustment of fluoride to between 0.7-1.0 ppm in drinking water as the most effective and efficient way of preventing dental caries in communities receiving a reticulated water supply and strongly recommends the continuation and extension of water fluoridation programmes where technically feasible. We note the US recommendation of 0.7ppm adjust the previous 0.7 to 1.2 ppm recommended in the US, based on evidence relating to effectiveness, safety, and other sources of dietary fluoride. In the US report particular attention was given to evidence relating increases in rates of dental fluorosis between studies. Relevant NZ research has not found minor or mild dental fluorosis levels to be different in NZ populations with or without CWF. Further the NZ national oral health survey (MOH 2009) found that only 43% of children and 63% of adults brushed their teeth twice a day with fluoride toothpaste. These rates were significantly lower in Maori, Pacific and most deprived communities who benefit most from CWF a safe, effective, efficient and equitable intervention to improve and protect oral health throughout the life course. Our advice to Auckland Council is therefore that the current NZ recommendation of CWF at 0.7 to 1.0 ppm remains appropriate. Julia also notes in her reply that the Ministry of Health has also advised that there will be no change in the national policy CWF targets. Regarding the decision to fluoridate Auckland water, Stephen Town has advised that “Fluoridation as a policy matter is not on the Council’s current policy schedule for review/debate” and that “the Mayor has a statutory role to lead policy matters with the Auckland Council and he has indicated he does not intend reviewing this matter during his term in office (2013 – 2016).” Auckland Council. Where is the waste water for Auckland discharged? Watercare’s treated wastewater assimilates into the environment in different ways at its various wastewater treatment plants. The main plants at Mangere, Rosedale and Army Bay discharge highly treated wastewater into sea water. Some of the smaller plants discharge to land, some by surface spray and some by subsurface irrigation fields. All plants have resource consents which specify the quality the discharge is required to meet. Is there a Resource consent for the discharge of fluoridation chemicals into the sea, land , surface and subsurface irrigation? Can you provide the section of the consent that permits? Is there a Resource Consent held by Auckland City Council to add Hydrofluorosilicic Acid to Auckland’s water supplies? How much per annum is spent on Hydrofluorosilicic acid? The cost of fluoridation is withheld in order to prevent prejudice to the commercial position of our suppliers under s7(2)(b)(ii) of the Act. We can advise that the cost ranges between $200,000 – 300,000 per year. The cost equates to approximately 0.2 of a cent per 1000L of water. How much per annum is spent on implementing water fluoridation? 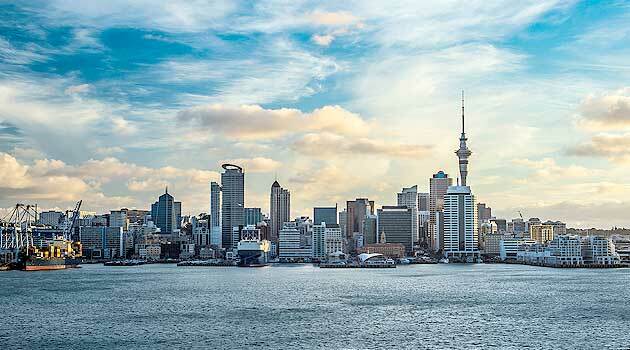 “The fluoridation of Auckland’s water supply is a minor component of a larger operations, maintenance and monitoring programme and therefore does not incur any further costs to our customers”. How much per annum is spent on testing the levels of water fluoridation? “Compliance testing associated with fluoridation of Auckland’s water supply makes up less than 1% of the total water quality monitoring programme, as do the associated costs. How much does it cost per Tonne of Hydrofluorosilicic Acid? How many Tonne of Hydrofluorosilicic Acid is added into Auckland’s shared environment? How frequent is the levels of fluoride in the water tested? When did fluoridation begin in Auckland and has there been any public consultation since beginning? Fluoridation started in Auckland in 1966. 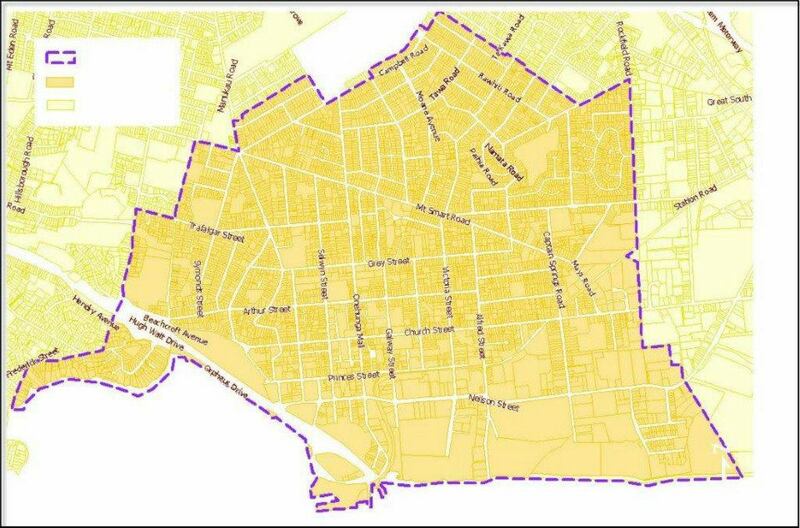 The basis for fluoridation in Auckland is from the North Shore City Council’s referendum in 1993/94. Who is liable from any damage as a result of fluoridation? Is Auckland Council liagble for any damage? Where are the fluoridation readings to confirm the concentration being added found? Results are published on an annual basis. Fluoridation readings can be found in the Water Quality reports (linked below). 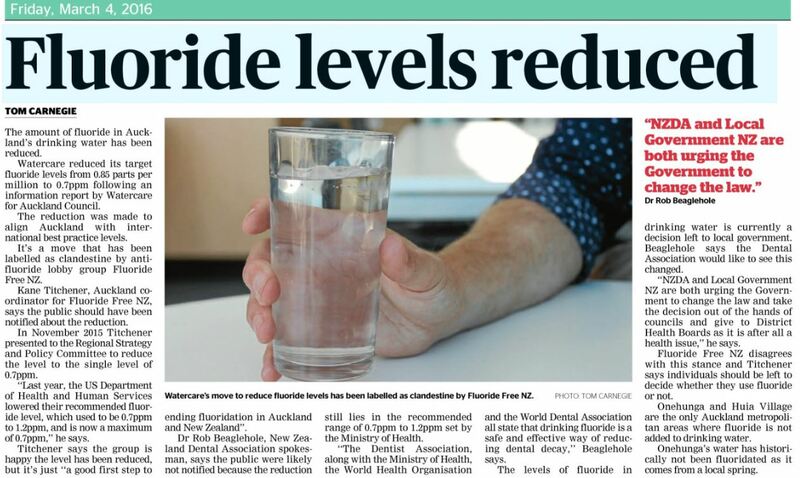 “Water fluoridation levels are published in the annual water quality reports.” Auckland City Council. Fluoride Free Auckland will be at the Go Green Event on the 16th & 17th of April, at the ASB Showgrounds in Greenlane, Auckland. See the event page for details. Dentists Dr Lawrie Brett and Dr John Jukes will be at the two day event and looks forward to meeting people to discuss the issue of water fluoridation. Fluoride Free Auckland will be at the Go Green Event on the 18th & 19th of April, at the ASB Showgrounds in Greenlane, Auckland. See the event page for details. Dentist Dr Lawrie Brett will be at the two day event and looks forward to meeting people to discuss the issue of water fluoridation. 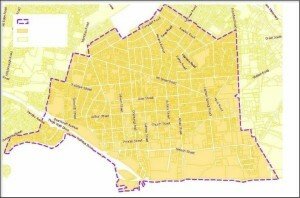 What areas of Auckland are fluoridated? To confirm if your tap water is fluoridated, contact Watercare Services Ltd.
On the 15th of January 2007, Auckland Councillor Dr John Hinchcliff presented a paper to the Auckland Council calling for an end to fluoridation in the city. Read the paper: IT’S TIME TO RECONSIDER FLUORIDATION. 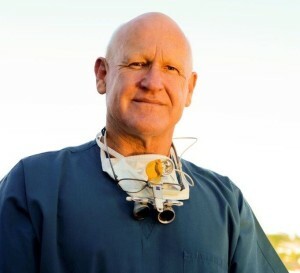 In February 2015, Fluoride Free Auckland welcomed Dr Paul Connett, from the Fluoride Action Network, back for the start of his 2015 Speaking Tour. 2014 has been focused on insisting that the Auckland Council review fluoridation in the form of a tribunal process. It began with Dr Paul Connett’s presentation at the Mt Eden War Memorial. See details of the correspondence with Auckland Council and the current situation of a review on fluoridation. 2013 Local body elections – Find out who to vote for. These CANDIDATES are FOR ending fluoridation. New Auckland Action Group started. Public meeting and presentation by world leading fluoridation expert, U.S. Prof Emeritus Paul Connett: 7.30pm – 9pm at Auckland University, Maclaurin Chapel Lounge, corner of Princes Street & Waterloo Quadrant. Public meeting and presentation by Paul Connett: 3pm – 6pm at Grey Lynn Community Hall. Auckland Mayoral Candidate Colin Craig states his position on fluoridation and clean water. *** Download notes from public meeting, including links for further research and action. To help us get an idea of numbers, please register interest and intended attendance here. What is it: Open, public meeting, all citizens of the Auckland region welcome – seating for roughly 500 people available. Cost: Free but a gold coin donation is appreciated to cover hall hire and other meeting costs (newspaper advertising etc). Meeting format: There will be an opening talk from the organisers then a video presentation on fluoridation and then a short Q&A session followed by final closing thoughts from the organisers. We are also working to get Auckland Mayoral Candidates to attend and briefly present their position on the issue. There will be printed meeting handouts at the door but also please bring a pen and paper to take notes if you wish. Time: 7-8PM (approx.) – meeting may run longer for those that wish to stay. Location: The school hall of Belmont Intermediate School is in the middle of the school grounds. There will be a footpath sign and balloons just outside the entrance to the hall to make it easier to find. Be careful not to confuse Belmont Intermediate with Takapuna Grammar School, which is immediately next door (they share sports fields). Parking: There is car park access from Lake Rd and from Winscombe St.